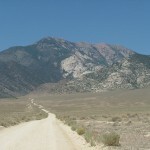 The East Island Road on Antelope Island leads to the Fielding Garr Ranch. Antelope Island State Park often gets overlooked when people think about a destination for recreation or a family outing. The island, however, has a lot to offer people who want to get away and see something not available elsewhere in the world. Such could be considered a bold statement but where else can you gaze upon snowcapped mountains from an island in the middle of a dead sea? In last week’s column, I talked about the northern half of the island, the beach, causeway and visitors center. Believe it or not, there is a lot more to the island. A good paved road runs down the eastern flank of the island for approximately 12 miles to the Fielding Garr Ranch. 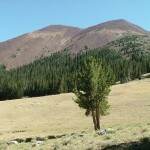 Along the road you will see Frary Peak, which is the high point of the island. There are numerous interpretive roadside panels that describe different features of the island such as the grasslands, springs, migratory birds, occupation by archaic peoples and other topics. At each of these waysides there is a different and stunning view of the lake and its environs. The first trail you will encounter along the road is the Mountain View Trail. It runs along the east shore of the island for 11.4 miles, gaining only 186 feet in elevation, which makes it an easy trail to follow. You will likely see bison along the trail, interesting birds and possibly other animals. You will also likely encounter hordes of insects depending on the time of season, so plan your hike accordingly if you follow this route. The Mountain View Trail has several different trailheads and access points along its length. Access to shoreline playa is the trail’s main attraction. The last time I was there I saw several bison who had wandered onto the hardpan and were sunning themselves on the salt. 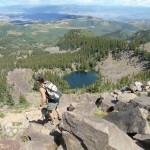 The next major trailhead is the Frary Peak/Dooly Knob Trail. These are more intense trails that access lofty overlook points. Frary Peak Trail takes you to the highest point on the island, gaining 2,080 feet in 3.2 miles. 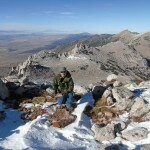 It is a long, dry and rough trail but the summit view is rewarding. You can gaze across the vast expanse of the Great Salt Lake to the west and to the Wasatch Range to the east. The Dooly Knob Trail branches off the Frary Peak Trail not far from the start point and heads north .6 miles to the top of a rocky knob. Both of these trails are accessed from the same trailhead at the top of a steep paved road. The grade is 23 percent and reminds me of driving in San Francisco. Most of the trailheads have restrooms and helpful trailhead signs that clearly delineate distance overlaid on a detailed topographic map. There are several other interesting trails on the east side of the island, such as Frary Gravesite, Mushroom Springs, The Sentinel Loop and the South Island Trail. The South Island Trail is my favorite. The gate is locked on the road there, stopping vehicle traffic. A signboard near the end of the road states the distance to the tip of the island is just over four miles one way. Interesting points passed along the way include Daddy Stump Ridge and Garr Knolls. 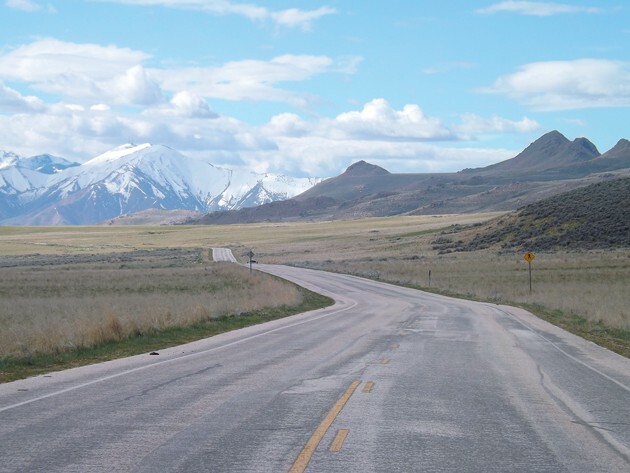 The trail leads to ancient rock outcrops on the south end of the island from which you can look south across the lake to the 1,200-foot-high Kennecott smokestack with the massive Oquirrh Mountains rising behind it. This trail would also make for an excellent mountain bike adventure. Before reaching the South Island Trailhead, you will pass Fielding Garr Ranch. This oasis was established in 1848 by Fielding Garr and shortly thereafter the island was designated an LDS Church range. Livestock were raised and the proceeds were put into the perpetual emigration fund that was established to help Mormon emigrants on their way to Utah. According to information at the site, the ranch house is one of the oldest dwellings in Utah. The ranch provides a wealth of information for the visitor on several topics, but the main intrigue for me was the history of sheep herding on the island. The intact sheep shearing facility inside the large barn on the ranch is fascinating. Back in the day, thousands and thousands of sheep winter ranged on Antelope Island and then were driven across the flats to Salt Lake City, up Emigration Canyon to summer on the Wyoming border near Castle Rock. At the height of shearing operations, 6,000-10,000 sheep were sheared every 7-10 days according to literature on interpretive signs. The information also stated that the average ranch hand earned $150 per month and worked 7 days per week from sunrise to sunset. It took about 30 minutes to shear a sheep by hand and about 5 minutes with mechanical clippers. Once the wool was sheared off, it was packed into bags and sent to woolen mills in Salt Lake City. After the sheep were sheared, a trap door opened and they would slide down a chute to holding pens. There is also an impressive blacksmith shop filled with old tools and an anvil. The shop makes you realize back then you couldn’t just order a part from the Grainger catalog — you had to make it. There is also an old grain silo and cistern. Around a spring that was the lifeblood of the place is a beautiful miniature forest of cottonwoods and ancient white bark trees. Deep deciduous leaves cover the ground in the forest among giant fallen logs. Inside the 1848 ranch house are oil lamps, stone fireplaces with cast iron pots, and old sewing and washing machines that give one the impression that life was not easy in isolation on the frontier. My favorite display was an old sheepherder’s line wagon parked near the barn. To enter it, you walk up a few steps and then you can peer in and see a bed in the back with drawers under it. There is a toilet in the corner near the bed and benches with storage under them. A cast iron wood stove provided heat and there are drawers everywhere for storage. I still see these wagons in use from time to time in Tooele County’s desert outback. I stood at the edge of the lake near the ranch and looked at Salt Lake City’s tall buildings, and wondered if the pioneers here could see the city’s lights at night. Antelope Island is an incredible place. It’s full of trails, history, wildlife and unforgettable vistas. Take sunscreen, bug spray and a good attitude if you visit in the spring and summer and then don’t forget that this place is a great destination in the winter as well. For more information about Antelope Island, call 801-725-9263 for the visitors center or 801-773-2941 for the entrance booth. More information is also available online at www.stateparks.utah.gov/parks/antelope-island.